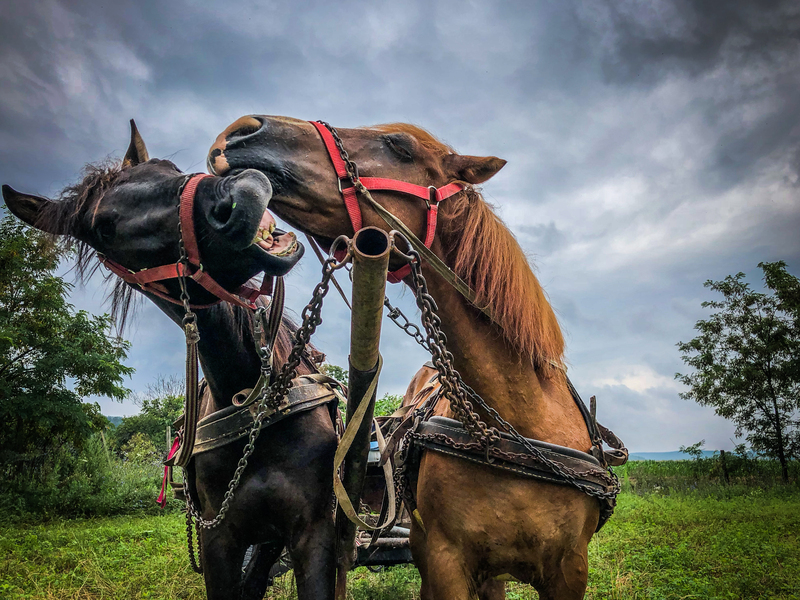 In the small village of Benești, a few hours’ drive west of Bucharest, locals use horse-drawn carts to go to the fields. They return with freshly cut hay or sand from the riverbed. Coachmen talk to their horses in order to indicate which directions to follow and the appropriate speed. “Dii” to move forward, “Hai” to go faster, “O” to stop. I’ve invited myself with the microphones on board for a ride. Communication runs through sounds and gestures, which in my lack of understanding Romanian language turn horse talk into universal language. Each in their own manner, man and animal, seem to understand each other. Voice speaks beyond words, inviting us to listen to timbre, rhythms and melodies that intertwine as they are spoken. as well as Anamaria, Laurențiu, Mara, Maria, Octav, Simina and Zsolt. Sound piece created during the SONIC FUTURE RESIDENCE organized by Asociația Jumătatea plină and SEMI SILENT to Conacul Otetelișanu, Vâlcea County, Romania in July 2018.